Published: Jan. 9, 2018 at 12:37 a.m. Updated: Jan. 9, 2018 at 01:53 a.m.
We started this college football season billing it as the year of the quarterback, but I don't think anyone anticipated it would end with a duel between two true freshman QBs. However, that's what we witnessed on Monday night in the national championship game. As I scout big games like this one, I usually focus on the draft-eligible players, but there are moments when young players etch their mark and do something we'll remember when it's their time to join the NFL. Monday night was that time for Alabama's Tua Tagovailoa. 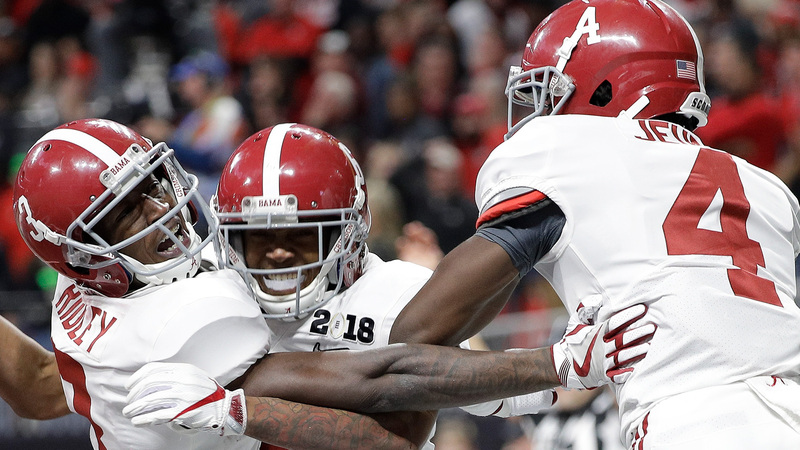 He replaced starter Jalen Hurts to open the second half and led Alabama back from a 13-0 halftime deficit for a 26-23 win over Georgia in overtime. Here are five takeaways from scouting the incredible title game. 1. Tagovailoa made a couple mistakes, but he showed poise well beyond his years. Every time I thought he might crumble under the pressure, he would bounce back and make a play. In overtime, he took a bad sack, but he threw the game-winning TD pass on the next play. He finished the night 14 of 24 for 166 yards, 3 TDs and 1 INT. I've heard buzz about Tagovailoa, a former five-star recruit, for the past year. Everyone I hear from raves about him, and I can see why. To be thrown into that atmosphere in the second half was a gargantuan task, and he did not look like his heart was racing at all. 2. There was a lot more good than bad from the other true freshman QB in Monday night's game, Georgia's Jake Fromm. He didn't make enough plays late in the game, but he certainly didn't fall apart against the vaunted Alabama defense. He was in full attack mode, going 16 of 32 for 232 yards, 1 TD and 2 INTs. He'd like to have some throws back, but he has all of the tools of an NFL QB. The future for Alabama and Georgia looks very bright, and these two young QBs are a big reason for the optimism. 3. I received a few text messages during the game from NFL scouts saying Alabama WR Calvin Ridley is going to be much better in the pros than he is in college. Alabama struggled to get him going early, but he made two huge catches down the stretch against Georgia, one for a TD and one to put the Crimson Tide in range for a potential game-winning field goal, although they were unable to convert on that opportunity. Ridley might have been the most talented player on the field Monday night. 4. I wished Georgia could have kept RB Sony Michel going because he had the hot hand early. He showed off his agility with a long run in the first half against Alabama. I like Michel a little bit better than Bulldogs RB Nick Chubb as a prospect. Michel can get to the edge a little bit better, and tonight reinforced that against a fast defense. Michel was able to get outside. Chubb's more of a banger inside. 5. Alabama DT Da'Ron Payne has made the most of his platform these last couple weeks. Payne dominated at the point of attack, resetting the line of scrimmage. He was very active. I think he's a better player than former Alabama DTs A'Shawn Robinson and Jarran Reed were coming out of college. The other Alabama defender I had my eye on Monday -- Alabama DB Minkah Fitzpatrick, who was dealing with a kidney injury. He's one of the top talents in the college game, but he was not a big factor in the game. On the other side of the field, Georgia LB Roquan Smith flashed once again on Monday night. He's a perfect player for today's NFL. I love his instincts and speed. He makes plays sideline to sideline. He can run and cover. He's helped himself this postseason. I was very impressed with him last week against Oklahoma in the Rose Bowl and he carried that momentum over to the title game.